All string students are welcome. Wind students are accepted by audition. GGP is proud never to have turned a student away for inability to pay. We offer scholarships based on need. For scholarship information, please call 415-294-0656. Complete an online registration form for each enrolling student. Pay the registration fee for each enrolling student. Pay full tuition payment by credit card or check by September 20th or sign-up for a Payment Plan. Two (2) payments, with tuition evenly divided and due September 20th and January 20th. Three (3) payments with tuition evenly divided and due September 20th, November 15th and January 20th. We will send you a link to the audition sign-up form in late August. Your registration fee and tuition (or agreement to one of the two available tuition payment plans) is required before you can receive the audition sign-up link. Financial aid is available for qualifying families that apply no later than September 30th. See Financial Aid Form and Contract. 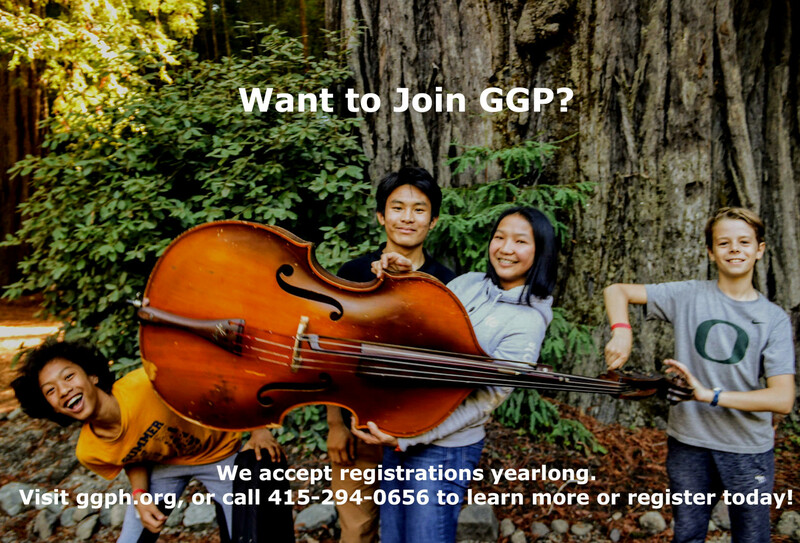 For more information, email office@ggph.org or call (415) 294-0656. You can pay tuition and other fees online through our PayPal PAY TUITION/FEES button. 1. Select an item from the dropdown menu to add the item to your shopping cart. 2. Click on the PAY TUITION/FEES button. This will take you to a GGP page on the Paypal site. 3. On this page, you can either CONTINUE SHOPPING and add more items to your cart and either log into your PayPal account, or pay without a PayPal account. 4. Please put additional details in the notes field or email our bookkeeper at office@ggph.org.